Upon it’s release in 1982, Roland initially marketed their TB-303 bassline synthesiser as a tool to provide looped accompaniment for guitarists to practise alone. The 303 was later repurposed by Chicago DJs and musicians in the emerging house scene, when its distinctive sound would drive its own sub-genre – acid house. Whilst Phuture’s ‘Acid Trax’ (1987) is recognised as the first acid house record, the definitive TB-303 track came much later, in 1995, in the form of Josh Wink’s ‘Higher State of Consciousness’. Given this context, it’s a little surprising to that the first chart hit to feature a TB-303 was this mid-tempo single from the Scottish post-punk band Orange Juice. At the time of its release, the band had actually been in existence for 8 years, initially as the Nu-Sonics, then following line-up changes, under their new name Orange Juice in 1979. Their debut album, ‘You Can’t Hide Your Love Forever’ reached number 21 in the UK in 1982, but ‘Rip It Up’ was the only one of their 14 singles to break the top 40 (it reached number 8). 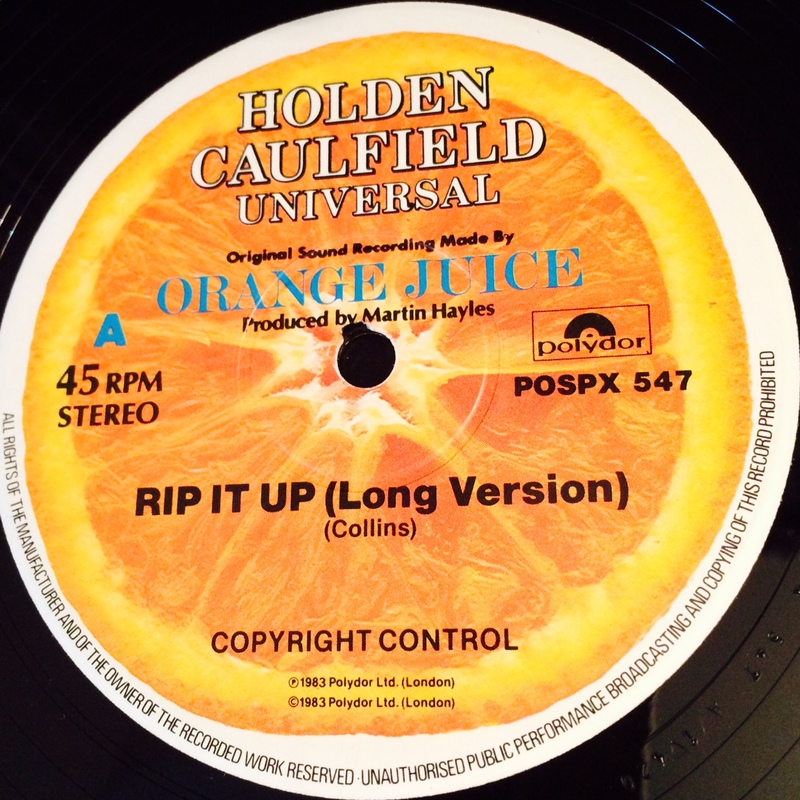 ‘Rip It Up’ was the second single from the album of the same name, and featured a different sound to the band’s 9 previous singles – more synthesiser-led and with a groove that was quite likely inspired by Nile Rodgers and Chic. The track itself was written by singer Edwyn Collins, who over a decade later had an even bigger hit as a solo artist with ‘A Girl Like You’. In another curiosity, ‘Rip It Up’ features a segment of a Buzzcocks guitar riff, from their track ‘Boredom’, which we hear as Collins sings the lyric “my favourite song’s entitled Boredom”. 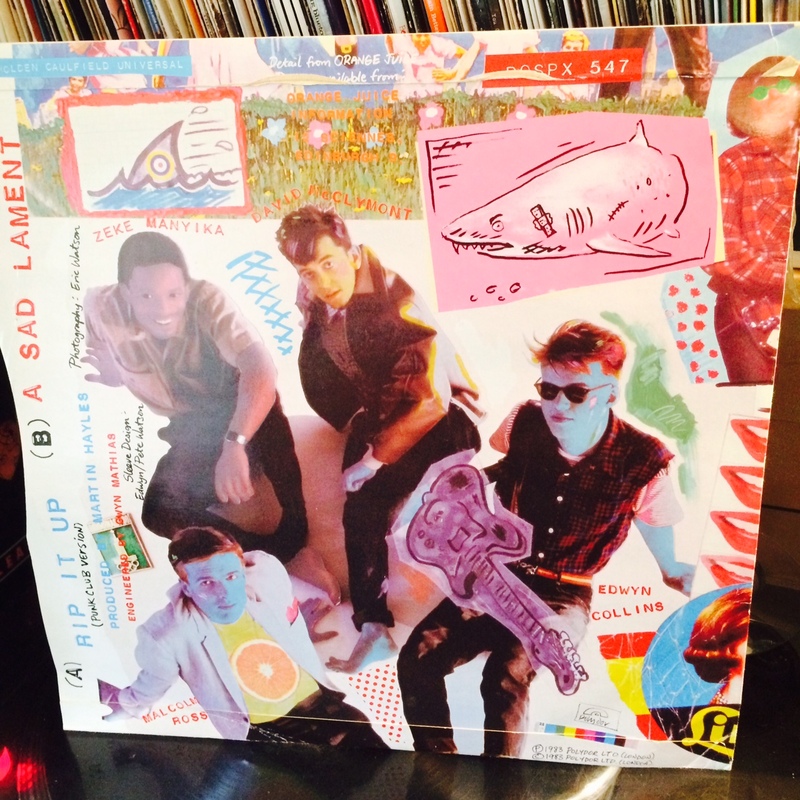 As for this 12” version, we’re treated to a longer and slightly meatier sounding version on the a-side, and an extended version of the b-side, ‘A Sad Lament’ on the reverse. The TB-303 bassline, so prominent in the 7″ version is largely absent in the Long Version. The artwork, drawn by Collins himself, shows a fighter plane with cartoon teeth and eyes, partially submerged in the sea. 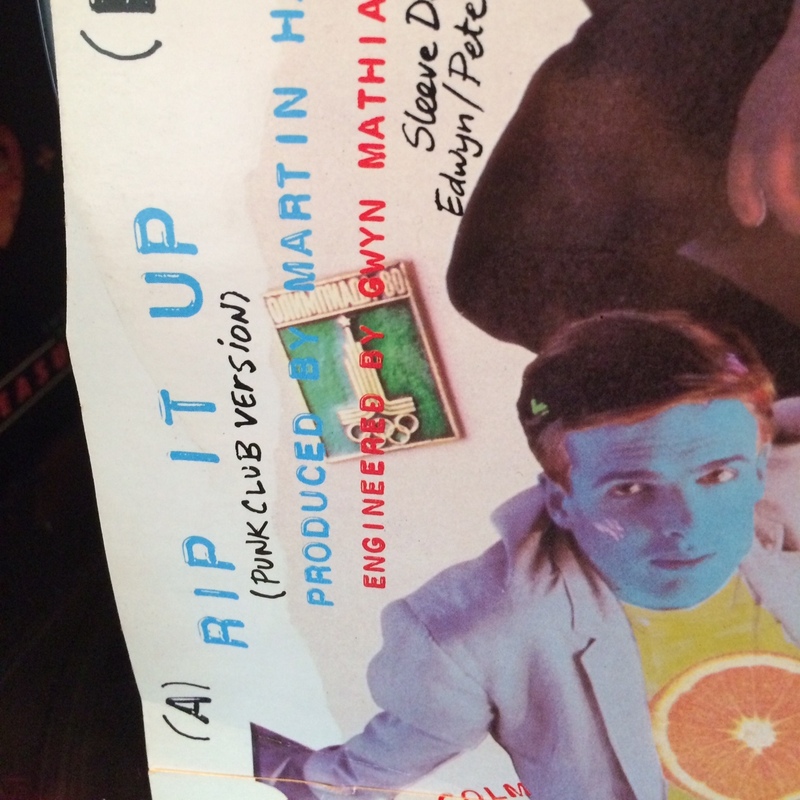 ‘Rip It Up’ is a record that sounded fresh on its release in 1983, and like many classics, still sounds contemporary today, more than three decades after it was recorded. 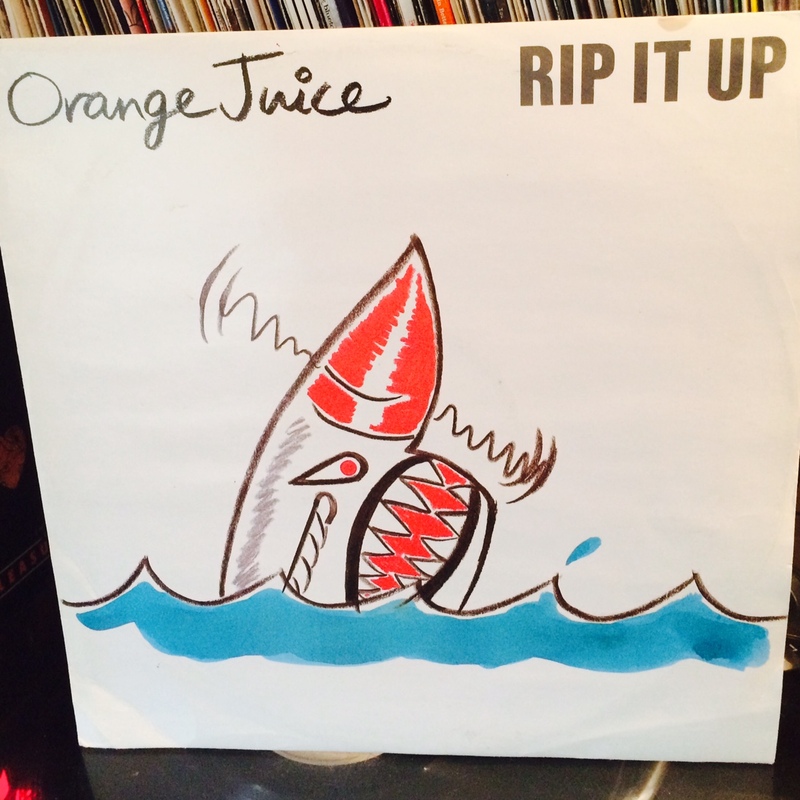 This entry was tagged 12", Edywn Collins, Orange Juice, Record, Rip It Up, Vinyl. Bookmark the permalink. Thank you Edward, it’s a pleasure to do these. Writing about them makes you listen in much more detail, and makes you work through the backstories in more detail too. Nevertheless I’m really pleased to hear you are enjoying following the series, and I appreciate you taking a moment to comment too. Thanks, Steve.